Warning! This tool is deprecated since UDOObuntu 2.0. It is present only in UDOObuntu 1.0/1.1 versions. On UDOObuntu 2 use Web Control Panel instead. 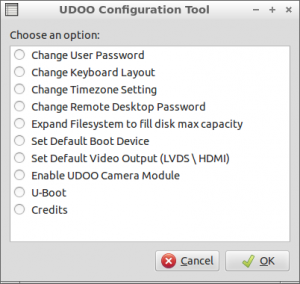 UDOO DUAL/QUAD Configuration Tool is a utility created to assist UDOO DUAL/QUAD basic and advanced Configuration. It comes preinstalled on UDOOBuntu Official UDOO DUAL/QUAD Operating system. Change User Password Selecting this you'll be able to change default password for user ubuntu. This changes default keyboard layout. This changes default timezone setting. This affects the Network Time Timezone Setting and sometimes can solve Networking Problems. This changes the default Password of VNC Server. Default is ubuntu. This expands filesystem of current Root Partition to fill the disk capacity. This edits Uboot Environment allowing to select default Boot Device from MicroSD Card, SATA Drive or NFS. This allows to enable UDOO DUAL/QUAD LVDS Panel, 7 or 15 inches. A reboot is required to enable them. This changes the quantity of memoery to allocate to the video card and to the framebuffer.